Starring Vincent Wong (王浩信), Mat Yeung (楊明), Philip Ng (伍允龍), and Rebecca Zhu (朱晨麗), the TVB anniversary drama Fist Fight <兄弟> dropped its first teaser trailer on September 25th. Fist Fight will premiere on November 12, leaving just enough time for it to compete at the 2018 TVB Anniversary Awards. Kaman Kong (江嘉敏), Tiffany Lau (劉穎璇), Shek Sau (石修), and Gilbert Lam (林韋辰) also star in the drama. Philip Ng can fight, definitely looking forward to it. Cast is weak and story isn’t appealing….though I guess same can be said about the other 2 anniversary dramas as well. So this is the best that TVB can come up with nowadays…no wonder other series / TV stations are surpassing them in terms of relevance and quality. The ratings report came out this week and interestingly enough, the highest rated series in TVB’s golden timeslot is Story of Yanxi Palace, which hit an astounding 38 peak points (with the series averaging anywhere between 28 to 34 points every week)….TVB’s highest rated series so far this year is DITROC, which averaged 28.6 points over the entire course of its run – no doubt Yanxi is going to surpass this by the time it finishes airing on TVB. How ironic that a Mainland series which already completed its run outside of HK weeks ago (and is widely available for streaming on various platforms which means that most people have already watched the series) is not only getting better ratings than TVB’s own “original” first-time airing dramas, it’s also set to become TVB’s highest rated drama series for 2018 (though undoubtedly it will get absolutely zero recognition at the Anniversary Awards in December). 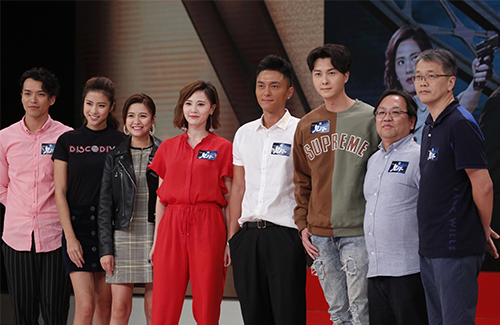 Vincent Wong mentioned the need to support local HK dramas and staying competitive and whatnot – um, sure, yes Vincent, very true, but unfortunately the company you work for is the one company putting in the least amount of effort (which I guess shouldn’t be surprising since your boss Mark Lee doesn’t even believe in competition). Talk is cheap – TVB needs to show us through their actions that they are serious about maintaining their number one status (or whatever it is they claim they are trying to do)…so far, I don’t see it…in fact, I haven’t seen it for nearly 2 decades already so I have very little confidence that anything is going to change in the future, unfortunately….